Will your class solve this math mission in time? 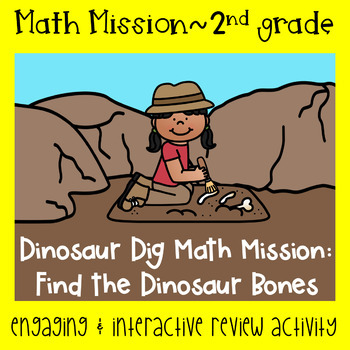 This fun and engaging game involves your students in a timed, interactive game where they are trying to help find the dinosaur bones and complete the dinosaur dig before time runs out. Students will solve a series of questions and clues in order to compete the tasks required to solve the mystery. Review important 2nd grade math skills involving addition and subtraction within 100. 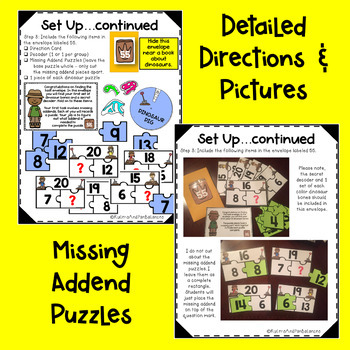 Students will complete missing addend puzzles using a part-part-whole puzzle, sort addition and subtraction word problems, solve a two-step problem, use a secret decoder to discover clues, and use a marker to reveal secret numbers. This mission is great for a review at the end of a unit or to maintain skills throughout the year. It would even work at the beginning of 3rd grade review of those 2nd grade skills. Be sure to check out the preview to see a glimpse of what is included. I have tried several breakout session/escape room activities with my students in K-2. I have found that they are more successful with the teacher leading the activity and having activities that all students can participate in. 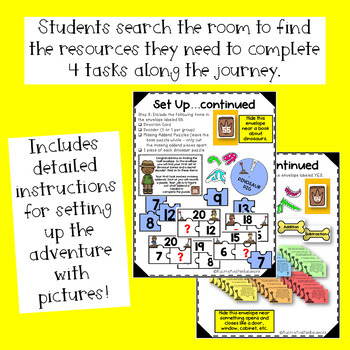 I have purposefully designed this math mission to include materials for all students to have the items needed to complete the tasks (up to 32 students). Also included is an interactive power point that allows the clues and tasks to be projected and easy to read. 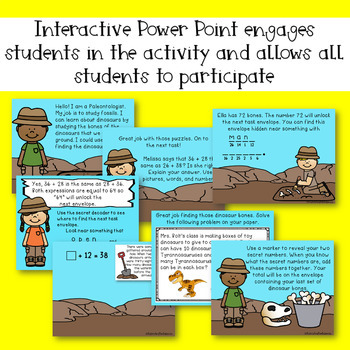 The power point makes it easy for the teacher and the students to navigate through the activities. Notes for the teachers with detailed instructions are also included. A student recording sheet is included for students to solve problems and record their math thinking. Similar to a scavenger hunt, students will have 4 opportunities to move around the room and look for the mission envelopes. These envelopes will contain the materials they need to complete the next task - missing addend puzzles, addition and subtraction word problems sort, problem solving using combination of ten, and a mystery number computation problem. Everything is included except for the 4 envelopes the teacher will need to provide. There is some prep work required to set up the game. I have tried to keep that prep work down to a minimum. There is also a detailed list of instructions with pictures and a checklist to make it as easy to follow as possible. You will not need to buy those expensive locks and containers. The envelopes you use will hold all the materials and they can be “locked” with the number or word from the problem the students have to solve to gain access to the location of the envelope. If they answers do not match, they need to rework the problem before they can open or unlock the envelope. This Math Mission is also available in a 1st Grade or a Kindergarten version.